Congratulations on your outstanding accomplishment! 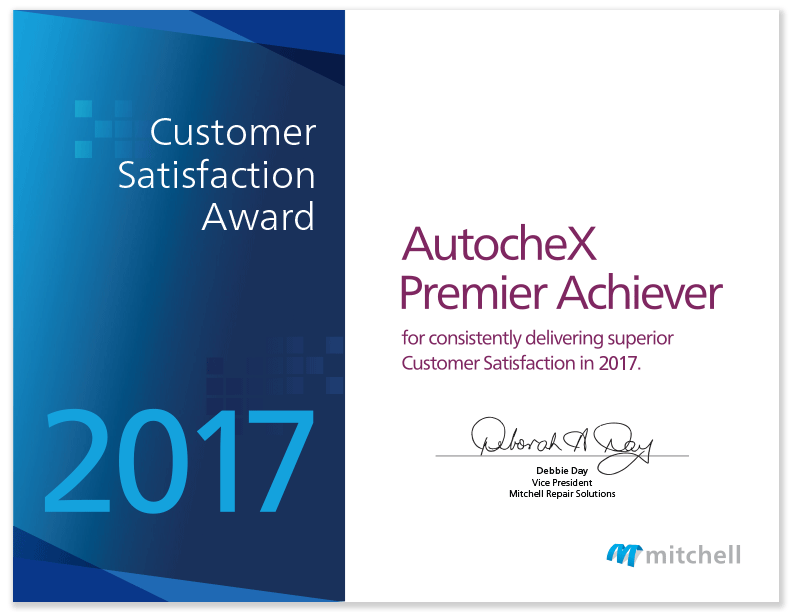 Mitchell is proud to sponsor the annual AutocheX Premier Achiever Award (PAA) program to recognize collision repair facilities that achieve extraordinary customer satisfaction ratings. This honor brings industry recognition that sets your organization apart. In recognition of your award, Mitchell will send you the 2017 Premier Achiever certificate and also help you publicize your great accomplishment as an AutocheX Premier Achiever! You'll also have access to an exclusive Premier Achiever Award website where you'll find a collection of materials and resources to help you leverage this prestigious national award in your marketing efforts. At the close of the registration period, Mitchell will ship your certificate and send you a link to the Premier Achiever Award website. Mitchell AutocheX team at AutocheX.CSI.Award@mitchell.com. Publicize Award Mitchell and AutocheX would like to be able to publicize your accomplishment as an AutocheX Premier Achiever in a press release, on our website, etc. But to do so, we need your permission: YesI authorize Mitchell to publish my name, shop name, and any photo images relating to the AutocheX Premier Achiever Award on the Mitchell-AutocheX websites, in press releases distributed to media, and in Mitchell International publications. No I do not authorize Mitchell to publish my shop name.